The trusted Word app lets you create, edit, view, and share your files with others quickly and easily. 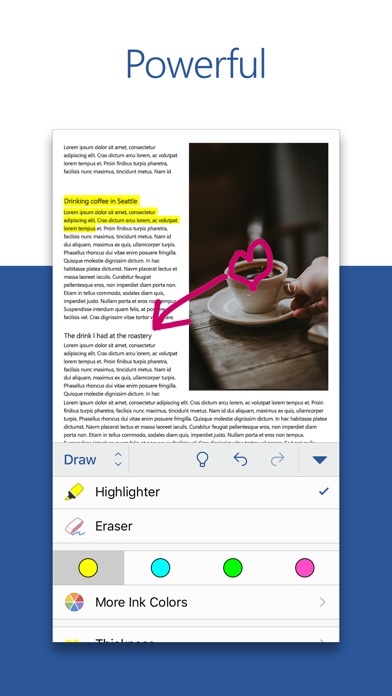 Send, view and edit Office docs attached to emails from your phone with this powerful word processing app from Microsoft. With Word, your Office moves with you. Whether you’re a blogger, writer, journalist, columnist, student, or a project manager working on documentation, Word is as handy as you want it to be. Make impactful text documents, scripts, blogs, write-ups, or resumes. Customize your document, letter, resume, or notes your way with robust tools that enable you to accomplish your best writing with the best format options and templates. Get the complete Microsoft Office experience when you sign in with your Office 365 subscription. Create and edit documents, collaborate and share with ease when you download Microsoft Word today. Create Documents • Jump-start your projects, assignments, letters, blogs, scripts, notes, write-ups, or resume with beautifully designed modern templates. • Use rich formatting and layout options to note down your ideas and express them in writing. 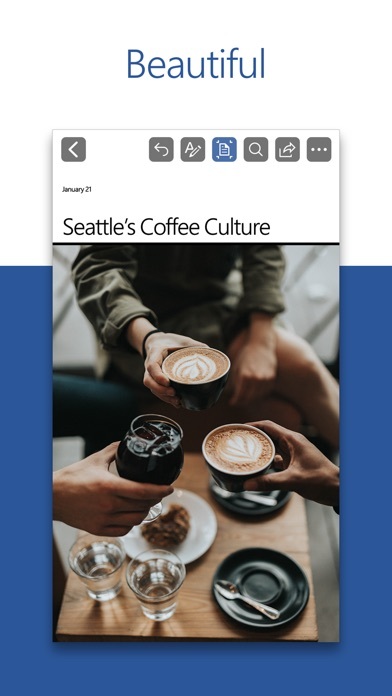 • Document formats and layouts stay pristine and look great on any device. 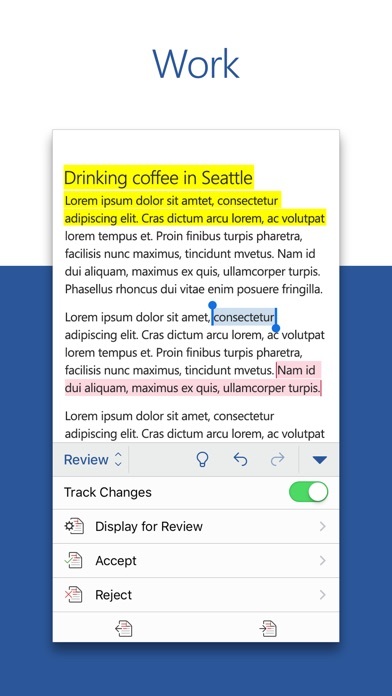 Read, Write, & Edit Documents • Reading view lets you read lengthy docs, letters, scripts, and more on your device with ease. • Use familiar writing and editing tools as you’d find on a desktop word processor. Collaborate Anywhere • Share thoughts by commenting in docs right next to the text you’re discussing. • Everyone can collaborate and stay on top of changes to the text, layout, and formatting. • As you and your team make changes, you can revert to view earlier drafts with improved version history in Word. Simplified Sharing • Share files with a few taps to quickly invite others to edit or view your documents. • Easily manage permissions and see who’s working in a document. • Copy the content of your Word files directly into the body of an email message with its format intact or attach your docs to an email and make sharing easier. Download Microsoft Word now and get the best way to create, share and edit documents from your iPhone or iPad. To create or edit documents, sign in with a free Microsoft account on devices with a screen size smaller than 10.1 inches. 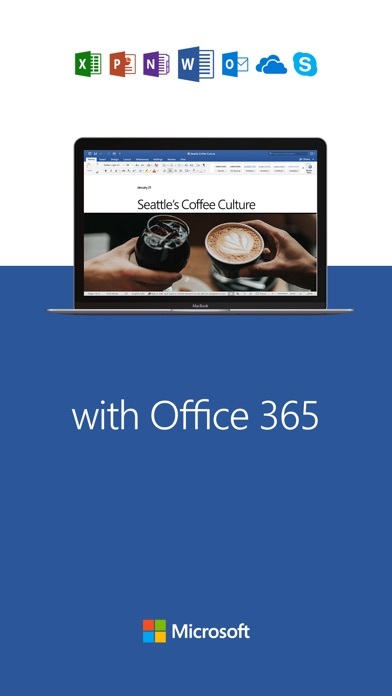 Unlock the full Microsoft Office experience with a qualifying Office 365 subscription (see http://aka.ms/Office365subscriptions) for your phone, tablet, PC, and Mac. 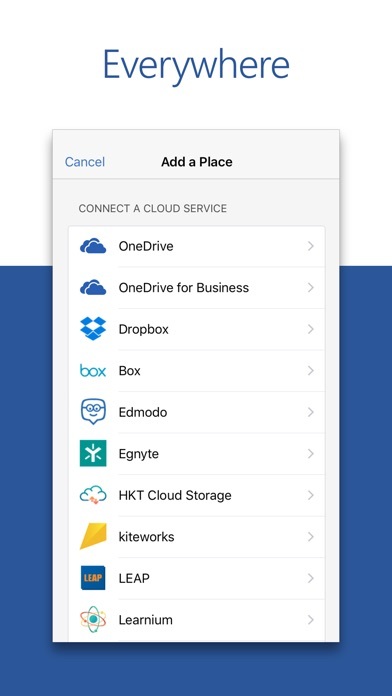 Office 365 subscriptions purchased from the app will be charged to your App Store account and will automatically renew within 24 hours prior to the end of the current subscription period unless auto-renewal is disabled beforehand. You can manage your subscriptions in your App Store account settings. This app is provided by either Microsoft or a third-party app publisher and is subject to a separate privacy statement and terms and conditions. Data provided through the use of this store and this app may be accessible to Microsoft or the third-party app publisher, as applicable, and transferred to, stored, and processed in the United States or any other country where Microsoft or the app publisher and their affiliates or service providers maintain facilities. Please refer to the Microsoft Software License Terms for Microsoft Office. See “License Agreement” link under Information. By installing the app, you agree to these terms and conditions. This app is awful! How do I end free trial and not get billed! Hideous! It’s terrible, horrific, my worst nightmare. I’m just waiting for one note to incorporate pdf’s in a printable format. Lack of reply, care, or concern from the developers? Why is it that as you read through the reviews that there are no comments from the app developers? Why wouldn’t the developers feel the need to make a comment, reply, or reach out to those that have paid you money for an app that is being sold and you are profiting from? Your lack of response is infuriating and outrageous! Please explain the lack of care and concern or follow up for the people that purchase your products and provide your livelihood? I don’t like the new icon. it looks like a modernized legacy icon. Great for all my projects. In the app, the lines are always crooked and never straight. I have to copy and paste my straight lines from PowerPoint to word. The app was updated in April 2019 and now autosave does not work like it used to. It is not automatically saving every time you make a change. I did not realize this, and I lost half my notes for class when I closed the app. The text options are also faded when typing at times, you have to tap the page multiple times to get it to work. When I type “command+b” or i or u to bold, italicize, and underline, it doesn’t work. Like I said, these functions worked fine before the app update. Please fix this. Thank you. This is Microsoft Word, with many features excluded. Yes you can write and edit, but simplest things like redefining a style is either impossible or very well hidden. Is it because it’s on iOS, not Windows or MacOS? Maybe so for certain features, but no. Open up Pages, Apple’s version of word processor, and check out all the things it can do from Smart Annotation where the annotation follows your text to style redefining. Not saying Pages on iOS is perfect; but it’s trying to get there, while MS Word (and other Office apps) still stuck in the era when iPad was just for YouTube, when now more and more professional apps are emerging to the scene, even including Adobe. Microsoft — get professional.